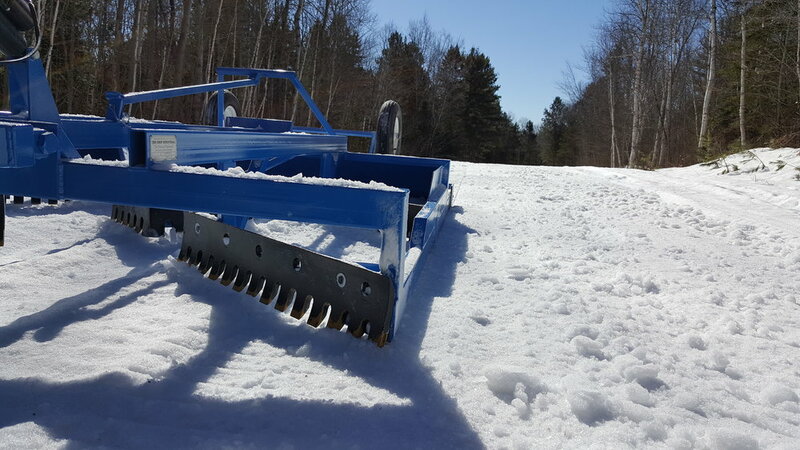 Mogul Master — The Shop Industrial inc.
A snowmobile trail groomer must do three things to effectively groom a snowmobile trail: Cut moguls, process the snow, and finally, compact the snow. No trail groomer does this better than a Mogul Master Multi Blade Planner. Cut the Moguls: To simply take the top half of a Mogul and drop it into the valley of the next mogul is asking for a re-grooming job to happen ... very soon, and at a big cost. The Mogul Master's multiple, angled cutting blades are designed to easily remove moguls, right down to the bottom of the mogul, removing all "memory" of the moguls from the trail so your groomed trail stays groomed far longer. Process the Snow: Snow must be effectively "processed" by the trail groomer to ensure a smooth, flat, durable trail. To complete this processing, the snow that the groomer is working must: (a) be thoroughly mixed or blended, (b) have the sharp edges of the individual snow flakes broken down, (c) be de-aerated and (d) have its temperature raised ever so slightly due to the friction created by the groomer. The Mogul Master's multiple blade design processes snow like no other trail groomer can. Compact the snow: Once the moguls have been eliminated and the snow is processed, the trail groomer must compact the snow to a hard, quick setting finish. Regardless of the model of Mogul Master, the packing pan is designed with high compaction in mind. 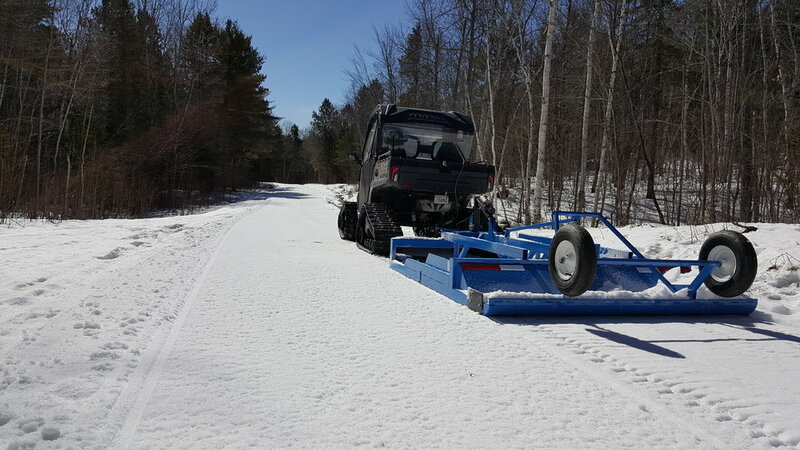 In our pursuit to offer the best working snowmobile trail groomers on the snow, for over two decades The Shop Industrial Inc. has relentlessly looked for ways to improve the best selling snowmobile trail groomer on the planet … Mogul Master Multi-blade Planers. Some years we carried out subtle improvements to the line with design changes here or there to increase the strength in a particular area. Other years we would perform more substantial changes that lead to dramatic improvements. For instance when we introduced the 11 blade and 7 blade Mogul Master models ... remarkable advancement in how the Mogul Master performed and the quality of trail it is able to create. In keeping with our goal of constant improvement The Shop Industrial Inc. offers an option that can be added to any one of our Mogul Master models to once again improve the performance of the best working trail groomers in the business. We call it AC AGGRESSIVE CUT. There are conditions when moguls can get extremely hard, frozen like concrete and can be very difficult to cut. The problem stems from the side rails riding on top of the moguls and not letting the blades get into those rock hard moguls. What we have done with the AC is reposition the outside blades to extend to the outside of the side rails so the rails cannot ride on the moguls. Simple yet effective. Very, very aggressive when the Mogul Master needs to be but at the same time an easier pull and improved performance when the conditions are not as demanding.